I listened to a session by Joel Kallman, and found myself thinking hard about this slide on the programmatic spectrum, diving into the concept of “low code” vs “high control”. At the green end, defining Authentication is very click-click-click, done. No code required. Around the middle, using Authorisation schemes can also be declarative, but with a little tweaking, can give a decent level of control. And to the right, for Custom authentication, while a typical package may look similar to the next, it’s driven with raw PL/SQL, but gives the developer high level of control. Some other interesting claims in the seminar include APEX meeting the NIST needs of cloud computing from 2002. Remember, we didn’t even have Google Suggest until 2005. And an application exported from 2008 still runs in 2017, many APEX versions later, looking and behaving the same. 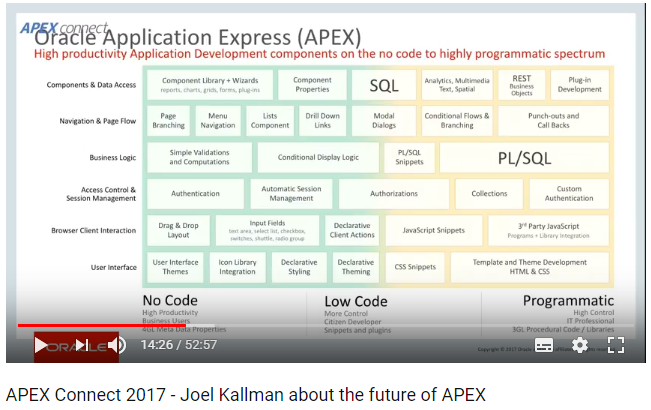 As a developer familiar with the aims of the APEX upgrade process, this does not surprise me at all. What I didn’t consider was how much of a feat this is in the world of development. Pretty impressive when considering version difficulties I've heard with products like JDev. I realise that's comparing apples to toaster ovens, but it's a high bar that's set. Onya APEX team.